Wood is the future. That’s the feeling you get after looking through the 2016 award winners named by WoodWorks, the United States wood building council. All of these structures are made from wood, but not the traditional two-by-fours you’re thinking of. 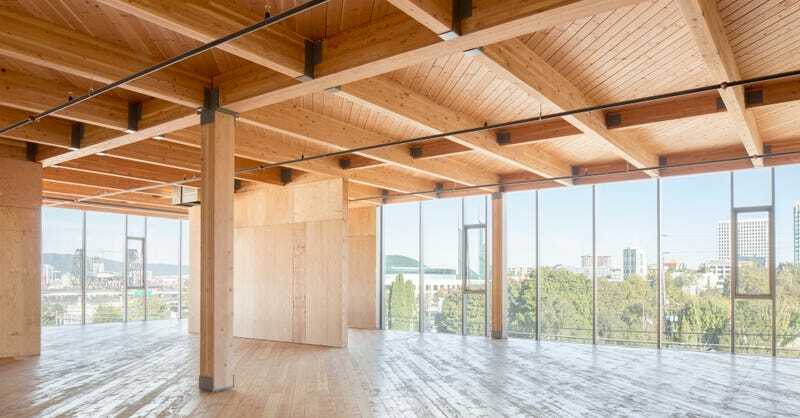 These buildings make use of innovative new materials like glued-laminated timber (glulam) and cross-laminate timber (CLT), both of which are gaining in popularity. They’re part of a family of materials named mass timber, where wood is cut, stacked, and glued to make a strong material even stronger. It’s cheaper, performs better in earthquakes, and is far more sustainable than most building methods out there now. It’s also made here in the US—most mass timber products come from Southern Oregon. For a good example of how the new wood works, take the top photo here from a project named Framework, an office tower in Portland, Oregon. From the street you might not notice any difference between this building and its century-old neighbors. But instead of masonry walls, the building is almost entirely composed of Douglas fir glulam. And that wood is left exposed for a stunning effect. That’s the real beauty of wood—it doesn’t need to be covered up. WoodWorks picks the best buildings that are using wood in non-residential applications so you can see how architects employ these materials on a larger scale. The hope is that by showcasing wood in such versatile designs, wood will become the material of choice for more and more architects down the road. This five-story building is part of a new wave of wood buildings in the Pacific Northwest. PATH is now working on the tallest wood frame structure in the US, also in Portland. A public pavilion created for Chicago’s Architecture Biennial was the first project to use CLT in the city. If a firehouse uses wood, that should tell you something about the material’s safety and resilience, right? In fact, mass timber burns much slower than many other building materials. Wood is not allowed for many applications due to antiquated Seattle building code. But this project was able to get an exemption because of the proven fire-resistance of mass timber, paving the way for more projects. The roof is made from sheets of bamboo that act as sunscreens. The roof of this structure is covered with solar panels, and the concrete floor offers radiant heating, to make it an incredibly efficient building. The affordability of wood makes it an ideal candidate for budget-minded projects like schools. The basket-weave of Aspen’s art museum not only protects from solar gain during the sunny summers; it’s also an effective tool for shouldering snow accumulation in the winter. Architect: Shigeru Ban Architects; Structural Engineer: KL&A, Inc.; General Contractor: Turner Construction; Photo: Greg Kingsley, KL&A Inc.
Another great application for wood: Museums, where heavy use from visitors only adds to the patina of the wood. Local cedar was sourced from nearby forests and made into affordable plywood for this park facility.